This recipe is a great way to get your kids to eat more veggies, it’s pretty mixed in with the meat. It’s a quick dish, ready in under 30 minutes and also gluten-free, keto, whole30 and Paleo, as well as Weight Watcher friendly of course! You can’t beat the convenience of pre-cut or frozen cauliflower rice, but the shelf life of pre-cut fresh life is short, and the frozen is fine, but they use more stems and less florets. For the best taste I prefer to make it myself, it’s so fast and easy to make with a food processor (this is the one I have) affil link. To make cauliflower rice, in batches, place a few florets in the food processor and pulse a few times until it resembles rice. You don’t want to over process it, 3 times is usually enough. You don’t want to overcrowd the food processor or it will require you to pulse it more, resulting in over-processed pieces. To cook, I simply saute a little oil in a skillet and add the cauliflower until tender. If cooking in a sauce, you can add the cauliflower rice once the sauce is simmered and ready, as it only takes about 5 to 8 minutes to cook the cauliflower. You can also roast riced cauliflower in the oven, which gives you a wonderful nutty flavor. See my Roasted Cauliflower Rice recipe here. Over high heat, brown the turkey in a large skillet breaking it into smaller pieces as it cooks, about 5 minutes. When no longer pink add 1 teaspoon salt and the dry seasoning and mix well. Remove the cover and add the cauliflower, add 1/4 teaspoon salt and cook until tender, about 8 minutes. Transfer to a plate and serve with avocado, lettuce, salsa and lime. Are the toppings for this for 4 servings? Or 4 oz avacado and cup of lettuce for one serving? Can’t wait to try it!! This was so easy and delicious! I also added some black beans. Family asked for this to be on the regular rotation. It would be great to create an Indian bowl and an Asian bowl like this. We love your recipes-I have all the books and make at least 4 recipes a week. This was so amazingly delicious. My coworker that stopped eating meat for a year tried it and loved it as well because she’s trying to ease her way into eating meat again. This is one of our go-to recipes. 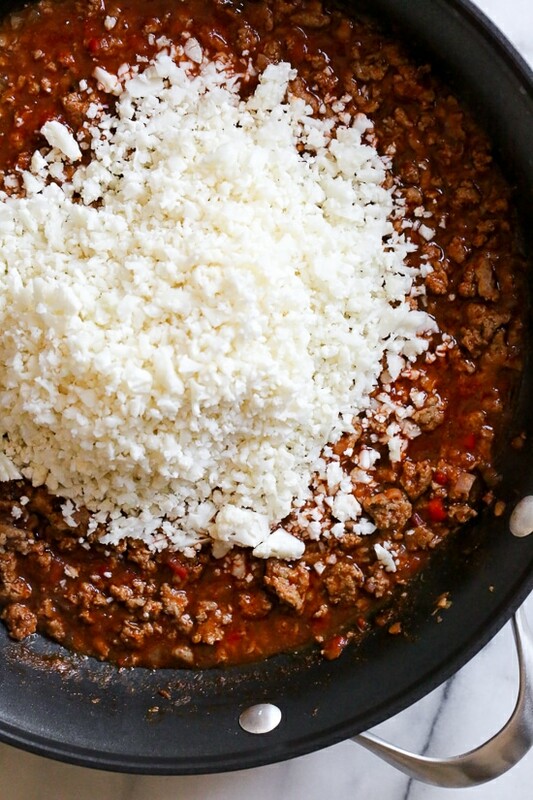 My husband loves it as written; I am vegetarian so I use meatless ground beef, and it is delicious. We’ve tried it with frozen and fresh cauliflower rice and it’s delicious either way. It is SO quick—less than 30 minutes from start to finish including chopping, and I’m a very slow cook. Best part is it’s easy to clean as you go, so cleanup is quick and easy. It’s pretty foolproof and tastes like it took hours. Thanks for another winner Gina. Yummy! Loved this recipe! Can this be frozen? I made this 2 days ago and it was great. Definitely a keeper and will make again. I adjusted the spices a little, but didn’t add anything more. The 4oz of tomato sauce covered the cauliflower well and it was great. Amazing recipe! I don’t typically like cauliflower but am experimenting with the keto diet. This was fantastic. More satisfying than with brown or even white rice. I did wind up just using the whole can of tomato sauce. I did wind up draining a bit after browning because I thought it looked too liquidy. But it was fine once I mixed the cauliflower in. Topped with avocado, just delicious. Great for meal prep! Pureeing your own cauliflower was super easy and you know exactly what went in it. Will make this a staple! 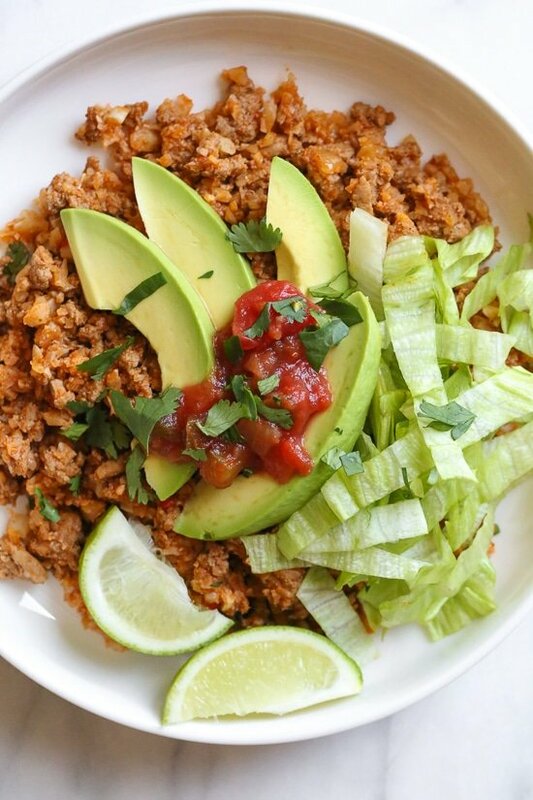 Have you tried making this with lean ground beef instead of ground turkey? What about with ground chicken? This was such a hit when I made it for dinner last week. This is definitely become my go to when I don’t know what to make. Delicious! It makes a lot, too. Can it be frozen? This is so delicious! I used smoked paprika and frozen broccoli and cauliflower rice. 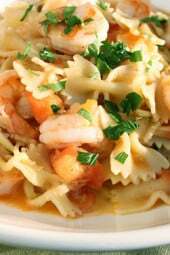 I loved the simplicity…I can easily make this after work and the flavor is outstanding. I’m doing the Whole30 and this recipe will be in the weekly rotation. Thank you for the great recipes! Do you know if there are brands of tomato sauce that don’t have any sugar? I want to make this but am currently eating a sugar-free diet. Thanks Gina! 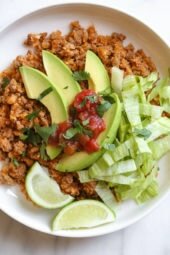 I made this with ground pork and it was amazing! It was so addicting, I was eating it out of the pan. Luckily, it was only for my hubby and me. 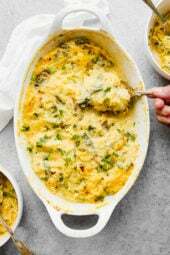 He loved it as well Thank you for one of the best recipes I have tried, and I have tried tons. Just made this tonight for supper. It is excellent, so tasty and filling. Thank you. What skillet did you use to make this? I am thinking of buying it. Thanks for all of your wonderful recipes. I love your site. I’ve made this several times, but tonight I switched it up a bit.. I added some finely chopped chipotle pepper (which I had in the fridge from a previous recipe) because I like the heat, and used a minced banana pepper from my garden instead of green bell pepper, because the banana pepper was just sitting there, begging to be used LOL. I also used frozen riced cauliflower. Amazing!!!!!! Thanks, Gina, we’re such fans of your recipes!!! Tried tonight for dinner. One word…AMAZING! I feel that way about every single one of your recipes I have tired. This is going to be a staple in my weekly menu. If I am using frozen already cooked cauliflower rice, should I just add it at the end? Thanks! I would cook it the same as instructed. This recipe is amazing! When I served this to my family tonight, they couldn’t stop raving about how delicious it was. Thank you!!! Dear Gina, I have to tell you that of the many recipes of yours that I’ve made they have all been exceptional. Easy, flavorful, filling, and my husband (who likes food, but is a disciplined, healthy eater, and tall and lean at age 66) told me to tell you he worships the ground you walk on (I asked him if he was ready to leave me for you and thankfully he replied “no”, smart man!). This is yet another winner and favorite. 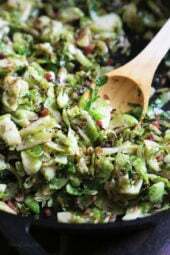 I share the recipes I try with friends and family and have referred everyone I discuss food with to your website. Thank you for providing those of us who are weight challenged with easy, delicious recipes that all shapes and sizes can enjoy. You are a godsend! Aww thank you Bonnie, tell your husband I am so happy he likes all the recipes!! Gina, Not only are you a great chef, you are a gracious lady as well. Thank you for responding. (My husband was pleased ?). Made it tonight and loved it! I also added a little more tomato sauce than asked for and it turned out great! I’m allergic to tomatoes. Is there an alternative for the tomato sauce? Leave it out is my guess, it’s hard to replace. They do sell something called nomato in my health food store. Its a tomato sauce replacement. Way better than I was expecting. I used the full 8 oz of tomato sauce and 2 bags of frozen cauliflower rice. Next time I will double the spices. Shockingly, my boyfriend liked it, too. Thanks for a great recipe. I made this today as my first Skinny Taste recipe – it was awesome! I added black beans, and used frozen riced cauliflower which I prepared per the directions on the bag and then folded in with the ground turkey mixture once it was finished simmering, just for a few minutes. I added light sour cream as well, and I was actually able to find 99% lean ground turkey at Harris Teeter which was an added bonus! Definitely trying some more ST recipes this week, and going forward – thanks! Great flavor and visually appealing! And packed with goodness but low calorie. Love this dish! Easy to make ahead and pac for lunch! Here is a question, when I am adding this in on my ww day, I fill in the nutritional info, yet it comes out as 7 points Freestyle. Any reason why there is a difference? You can’t use the nutritional info, you have to use the recipe builder. The nutritional info doesn’t take into account free (zero point) foods. Gina’s info is correct using the recipe builder. Can use bagged frozen califlower rice in this recipe? Great recipe. I would make this again. I had not made cauliflower rice so I appreciated the preparation method information. I added a 10oz can of black beans and 1/4 tsp cayenne. I 3/4 surrounded the plate with a lettuce/cabbage combo and the other 1/4 with tortilla chips. I put the meat mixture in the middle of the plate and also added a dollop of sour cream on top of the meat mixture. What makes this 5 points? One of your best recipes yet and i know because I make them everyday! Lol, glad you enjoy it Candace! Is the avocado included in the points calcularion? If yes what are the freestyle points w/o the avocado? Thanks in advance! I have been meaning to try something using cauliflower rice for a long time, and this recipe finally tempted me enough. At first I thought this was going to be a lot of trouble, but once I got started it was actually no more labor intensive than any other from-scratch dinner I make. And it was absolutely delicious! I was shocked at how well the cauliflower worked to replace rice in this recipe. I’ve been saving and making meals from Skinnytaste recipes for so long, some of them are from ten years ago and say “Gina’s Skinny Recipes” at the top. All the recipes are good and we’ve made them repeatedly, but some of them transcend “good” and hit “great.” This is one of them. Literally genius. Great way to get in extra veg without even thinking about it. Super easy. Super good. Just curious if the amount of tomato sauce is accurate. Says 4oz can tomatoes sauce. The smallest I can find is 8 oz. making this today. Looks great and easy. Made it tonight and it was really good. Whole family loved it. I wound up adding 8 oz of tomatoe sauce cause itnwas a bit dryier tha n I liked using four ounces. Just my preference. This may be a silly question – but one of the ingredients is 4 oz can tomato sauce. I have only seen 8 oz cans. Should it be 8oz or 1/2 of an 8 oz can? This recipe was easy and delicious! It’s getting printed out for my favorite recipe binder! I’m so glad I found this website for whole 30 recipes and other tasty light ones after I’m done with whole 30, I printed out 16 to get me through Whole 30! I made this last night and it was so yummy! I’m excited for leftovers at lunch today. This is easy and good! of course for me, I had to add jalapeno taco sauce because I like heat. Next time I’m going to try it with Turkey breast for less points to see if there is a discernible difference…another keeper! Thanks Gina. This was dinner tonight. Really good and like Greg said, very versatile. In fact, I remembered I had a can of diced chiles, so tossed them into the mix. I generally don’t keep ice berg lettuce for toppings, but instead used a finely shredded cole slaw mix. It was super easy and really good. Thanks for another great recipe. Just made this today for dinner and it was absolutely amazing. I’ve never made cauliflower rice before and I can now say I’m a fan. I will be making this again in the future. Gina – Does your calorie count include the avocado? I’m using WW Freestyle so am interested in the points. 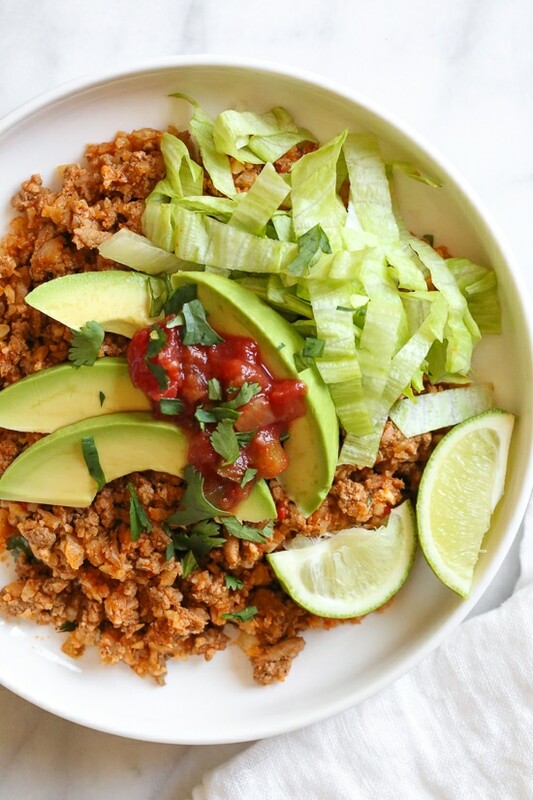 This is easy, delicious and healthy- I love it! Lesley, we added frozen and cooked it where it said to add it in the recipe and just turned the heat to medium low to get it cooked through and it was great. What an amazingly adaptable recipe. Olives, Jalapeños, Black Beans, Green Chiles.. sky is the limit. So clean eating and so delicious. The key is making sure that turkey and rice is cooked through. If it is, you are in for a treat. We saw it today and couldn’t wait to make it and it was really wonderful. Thanks as always Gina. Definitely in the rotation. Looks delicious! Can’t wait to try this!! ? Frozen, riced cauliflower makes cooking “rice” dishes so much easier. Would you just add frozen cauli rice at the end – the same as fresh/unfrozen? We used frozen to perfect results. 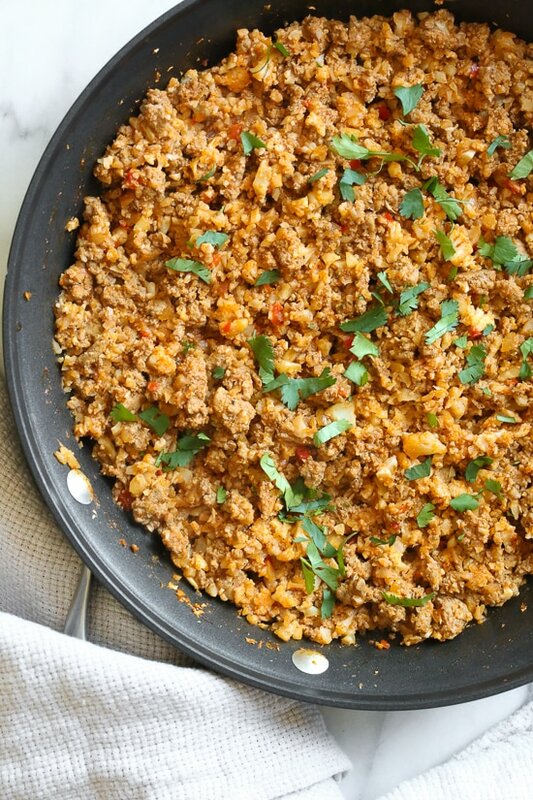 I’ve never used cauliflower rice but this looks great! Can you use this recipe for meal prep or does the cauliflower get mushy when leftover? I love your recipes! In my experience cauliflower rice doesn’t go mushy necessarily but isn’t as good after about two-three days. But with this recipe you could prep everything but the rice and add just the rice the night before or make it for the first half of your meal prep week. I made this Sunday , today is Wednesday and it’s not mushy at all! Could we add the cauliflower frozen? Yes! I’ve been making this exact dish for months with frozen cauliflower! This looks fabulous! My family and I love your recipes! We eat your recipes 5 nights a week! I have both your books and print many recipes from your website! I will be getting your next book as well. Thank you for making healthy food taste so great!!!!! I have lost 80 pounds and feel great! Thank you!!!! !